These are the 7 life lessons that Disney teaches us that we still very much need as adults. The Disney films are filled with great lessons which sometimes we need to re-watch the movies as adults to realise they are there. Anita and Roger from 101 Dalmatians are my favourite Disney couple as I feel they have the most honest depiction of a relationship. Two people fall in love, get married, are themselves with each other (I love it when Roger is messing around singing the Cruella De Vil song and Anita playfully calls him an idiot) support and love each other through both the bad and good. Disney often shows strong family bonds in its films, for example Ariel’s relationship with her father in The Little Mermaid. This relationship teaches that though sometimes you may have a rocky relationship with your family, sometimes you may think they treat you unfairly but in the end they are trying to help and protect you. Deep down you always love your family. 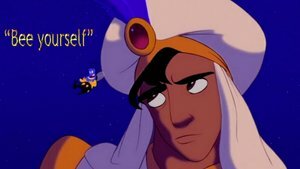 In Aladdin he believes that he need to be a prince to win the love of the princess Jasmine. But she loves him and respects him more when he is a “street rat”. When Aladdin is himself that's when he shines and is able to save the day. This is a great lesson, it shows that you may think you need to be a certain type of person or that you need to be the person someone else wants you to be but it’s always better to be yourself. Mulan defies tradition and the social norm and joins the army to protect her father. Yes she does this pretending to be a man but she (eventually) excels at her training and saves China from disaster. Disney’s Mulan shows that women are not always damsels in distress and are capable of defending themselves. In Cinderella though her life has kind of fallen apart she keeps on believing that things will get better and eventually they do. Most of us won’t have a fairy godmother come along and fix all our problems but if we stop dreaming we give up hope and faith in ourselves, we lose determination making it impossible to change our circumstances. One person can come into your life and change your perspective and ultimately change your life forever. John Smith’s life changes forever when he meets Pocahontas as she shakes up everything he once believed and shows him nature and life are precious. Pocahontas teaches that one person can touch you and change they way you think forever. It doesn't have to be someone you are in a romantic relationship with, it could be a friend, a relative, it could be someone you only meet through their work like an author or activist and so on. In The Lion King, Simba has face his past so that he may become the king he was born to be. Yes, we all make mistakes or enter relationships or circumstances that hurt us but the only way to deal with this is to face the things you have done, accept them and learn from them. If we hide from or deny our past we don’t learn anything and are more likely to make the same mistakes. So those are 7 of the many life lessons in the Disney films. Did you like this post? What lessons do you think Disney films teach? Please let me know with a comment and thank you for reading!